Like a passport stamped ‘Switzerland’, the first volume of Liszt’s Années de Pèlerinage opens with William Tell’s Chapel, so we have no doubt about which country we are in. 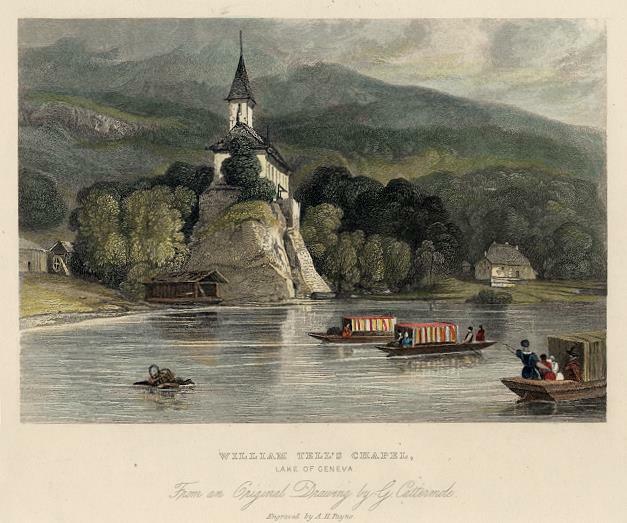 The chapel is near Lucerne, where Liszt and Marie d’Agoult started their travels; the current, modern building dates from 1879, so the chapel in the antique print is what they would have seen. The legend of William Tell is synonymous with mankind’s universal rebellion against tyranny. Tell was a popular figure during the French Revolution. Schiller’s play of the same name, from which Liszt uses a literary quote, was written in 1803-4; Rossini’s opera, using a French libretto based on the play, opened in Paris in 1829. Liszt transcribed its well known overture for solo piano. Liszt’s own tribute to Switzerland’s folk hero starts boldly in C major, Lento, then Piu Lento, with a noble, stately theme. So far, so good. Turn the page – and we are confronted with a startling array of tremolando demi-semiquavers accompanying another dotted note theme. Crescendo e accelerando, Allegro vivace, energico and rinforzando; the settling-in period, for both the pianist and the audience, is now officially over. Octave passages and repeated chords enable the fingers to limber up before a reprise of the grand opening theme with rich chordal accompaniment. Stirring stuff, which sets the scene for Liszt’s Swiss journey. This entry was posted in Composers, Liszt - Years of Pilgrimage, Three Volumes, Music, Places and tagged Années de Pèlerinage, Friedrich Schiller, Guillaume Tell, Liszt, Rossini, William Tell, Years of Pilgrimage - Switzerland. Bookmark the permalink.